In an email to staff days after publication, Noble president Constance Jones Brewer wrote that unspecified parts of the story were “exaggerated or plainly false.” At least two principals sent messages encouraging their teachers to ignore the piece. However, several teachers indicated the story aligned with their experiences. One current teacher reached out via an anonymous email, then agreed to talk if we protected their identity to avoid retaliation. The teacher related recent incidents of students receiving “unfair” detentions, including one case of a student punished for requesting makeup work. The teacher echoed what others had told us: That Noble enforces its discipline policies by sending auditors to observe teachers interacting with their classes. The audits are focused purely on discipline. “We DO NOT get audited from Noble to assess our ability to teach, only on our ability to control and get our students to submit to authority,” the teacher told us. The teacher, who works at a predominantly black campus, believes there’s a troubling disconnect between behavior required by Noble’s strict system and needs of students in the surrounding neighborhoods. “Noble schools want all the submissive and compliant kids or those that are very impressionable,” this teacher texted. “But kids on the South & West Sides (of Chicago) aren’t like that. You don’t survive in those neighborhoods that way. So what do the kids do? They fight the system and act just the opposite of what Noble wants. Other readers commented on the story website. One of the first came from “alexP,” a self-described Noble alum who later said he returned to Noble as an employee. He described having to kick a student out of class for not wearing a belt. It “literally broke my heart,” he said. “This said student had not been at school for a few days so that was his first day back. He told me ‘you have no idea the type of night I had but here I am at school but I get kicked out of class because of a belt.’ Those words broke me,” “alexP” wrote. Several commenters defended Noble’s policies. Ashley J Dearborn, a Chicago-based actor, wrote on our Facebook page that she worked with Noble CEO and Superintendent Michael Milkie during the time he co-founded his first charter school, after having taught at a Chicago Public School. “Mr. Milkie believed if given the right conditions, these Black and Brown kids could excel and compete with the best. They have. In order to achieve this, stringent rules and regulations were developed,” Dearborn wrote. Other families have said that choice slips away as CPS continues closing neighborhood schools. The issue of discipline at Noble schools was also addressed during a recent meeting of the network’s board of directors. Union activists attended the quarterly meeting and signed up to speak during the public comment period. Some were teachers, some were former teachers or alums, and some read statements prepared by alums who couldn’t attend in person. Noble officials have privately suggested that teachers are publicizing discipline stories as a way to promote their unionization efforts. 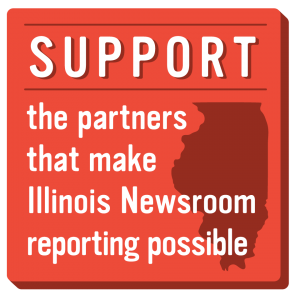 Our story quoted teachers who already left Noble, making them unlikely to directly benefit from unionization. At the board meeting, a statement from “Alfredo,” who graduated from Noble’s UIC College Prep in 2013, described the stress of the Noble curriculum and behavior expectations that he called “stifling.” His experiences contributed to depression and when he was 15, he said, he attempted suicide. During his senior year, he wrote, he was sustained by the thought of rebelling against the Noble system. “One of the only things that got me through the year was knowing that attending community college was going to be an affront to everyone who constantly prodded me with applying to schools that I couldn’t afford just so the school could have X percentage of students attending universities,” Alfredo wrote. Jesus Ayala Jr. also provided a statement. He said that he graduated from the original Noble campus in 2010 and now holds a master’s degree from Illinois Institute of Technology. “My high school years were very demeaning. The less money my family made and the better my grades and test score were, the more valuable a statistic I became. This was a best case scenario,” he wrote. The board did not respond to these statements. The teacher who was motivated to reach out by Brewer’s email is actively seeking employment elsewhere, and has continued texting information, despite the professional risks. 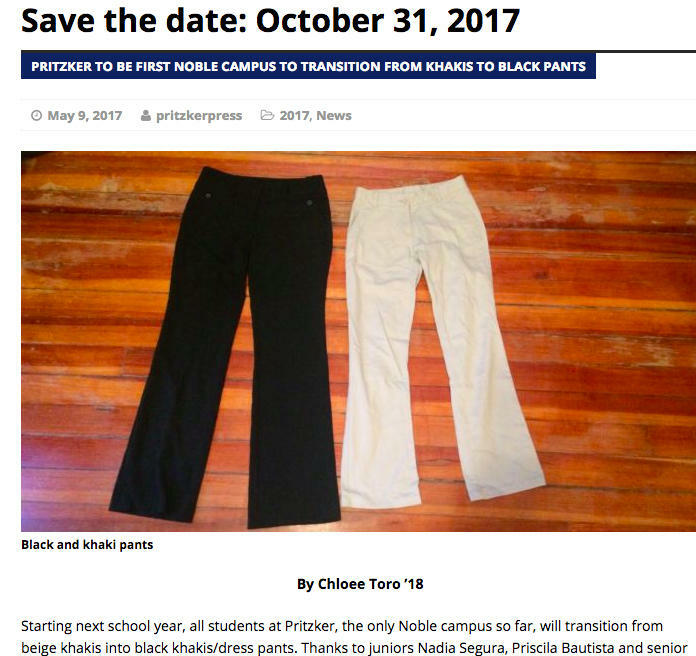 Editor’s Note, 5/18/18: This story was updated to clarify in a caption why students pushed to change the Pritzker dress code, and to provide additional context for the Noble teacher who asked for anonymity for fear of retaliation.